Say it with me... or better yet, don't. 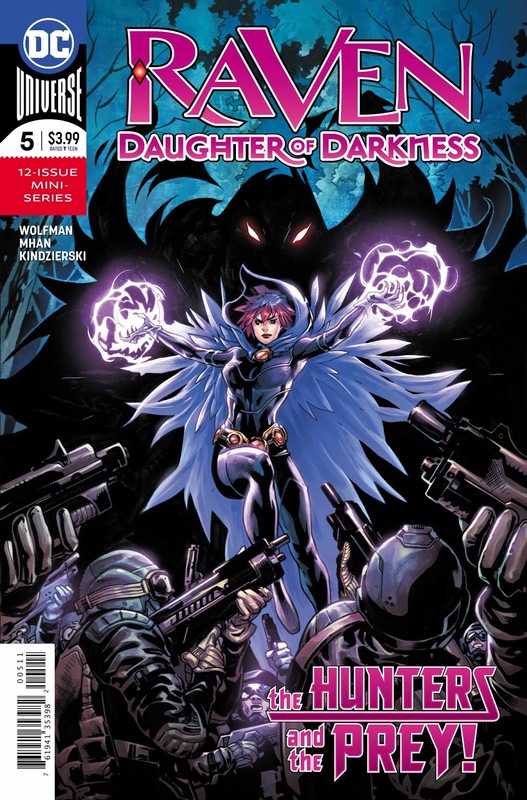 Boy, I wonder if this issue will have anything to do with the fact that Raven is the daughter of Trigon the Terrible? Man, that joke's getting to be about as played out as... stories featuring Raven being centered on the fact that she's the daughter of Trigon the Terrible! We pick up a little after where we left off... and it's immediately revealed that Raven and her mother survived the attack we closed the last issue with. If you recall, we had a girl with the anime eyes shoot down a 2MorrowTek chopper. Stands to reason that we open up with Raven and Mama waking up... at 2MorrowTek? Raven feels the presence of beings known as "The Shadow-Riders"... at the very same time, Baron Winters is regaling Sassycat (Grrrrrlll) with stories of those very same critters! Winters claims that the book he reads from is claptrap... which might just be Marv's way of trolling us. Little on the nose... no? 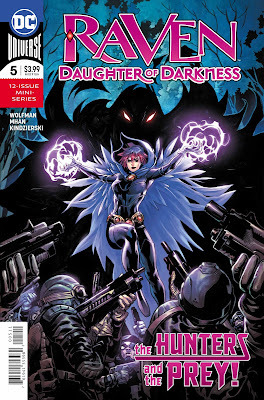 It's revealed that 2MorrowTek has been so set on capturing Raven in order to find out what makes her so different from the other "daughters of darkness". If you recall, they all come out with defected... so if the Tekkies are able to deduce Raven's "X-Factor", they can... get this, breed an army of Trigon's children. That's just what need. In the next room over, we rejoin those several Girls with the Anime Eyes... and learn that they are named after the color of said anime eyes. Not sure why they attacked 2MorrowTek to close out last issue... only to be with 2MorrowTek here? Were those not 2MorrowTek choppers last issue? Is there really another troop of generic foot soldiers tailing Raven?! Is there another troop of Girls With the Anime Eyes that are unaffiliated with those Girls With the Anime Eyes that shot down the chopper?! So many questions... and not'a one of 'em do I care to have answered! Raven and her mother are hooked up to some techno doo-dad... and, get this... summon Trigon the Terrible to Earth, because... what could possibly go wrong? Worth noting, at a Christmas Eve court hearing (do those even exist? ), Teri (she of the dead grandmother) is going to be sent to live with a cousin in San Diego. Riveting. This issue... I'm of two minds on it. It feels like things are finally happening... it's just that I really don't care one bit about it. If you're a fan of Trigon/Raven drama... you're probably going to dig this. I'm not... so this is a bit of a rough read. 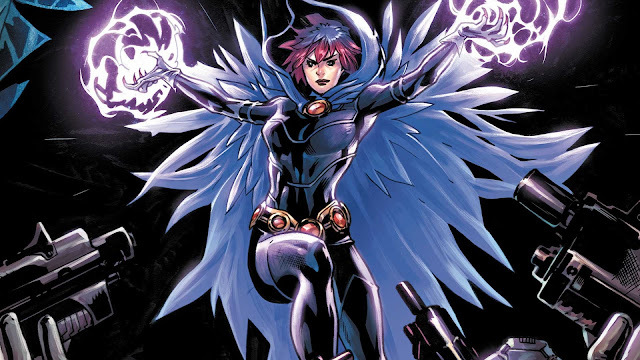 More Raven... more Trigon... seven more months? Probably the strongest issue so far, it feels as though we're actually making some moves forward. Unfortunately, it's still Trigon-centric. That record so desperately needs to be changed. Looks great, and hey... it's got a heckuva nice cover!